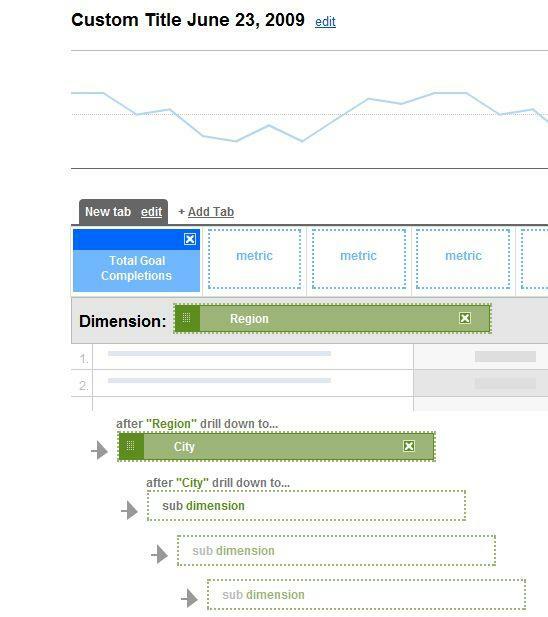 A really useful new feature of Google Analytics is the ability to create Custom Reports. In the “old” days I would find myself consistently choosing different options, filters, etc to get the report just right. With Custom Reports it is very easy to create, save and execute a special report whenever you need it. With local search it is especially important to know where your customers (not just potential customers) are coming from. Assuming you have conversion Goals set up in Google Analytics (if you don’t, you need to go do that now and come back) it is very simple to make a Custom Report breaking down your Goal conversions by city/state. Don’t forget to give your report a meaningful name before you save. After you save the report, it will be easily accessible on the left hand side of the screen under ‘Custom Reporting’ no matter where you are in Google Analytics. If you click on a state it will show you Goal conversions by city on the next drill down screen. That’s all it takes! If your local business is not ranking well in Google’s local ‘ten-pack’ when someone is searching for the products or services you offer in your area, you may be missing out on hundreds of customers or more each month. Yahoo Local and other local directories are also very important sites on which to have presence. Now you can get custom recommendations about your local search optimization with brick-n-mortar business services help YOUR local businesses achieve maximum presence in the local search results.